It begins with rhythmic handclapping, then a timpani hit with the pedal bending the pitch, then a rocking groove with bass and strings. 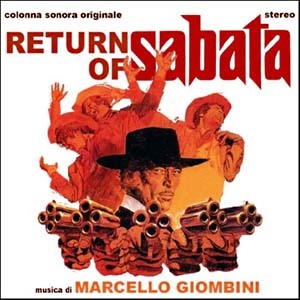 It's the main title music for our 129th Soundtrack of the Week: Marcello Giombini's score for Return of Sabata. After that intro, you hear the familiar twang of the spaghetti western electric guitar, and then the lyrics to the Return of Sabata theme. Then there's a bit I'm not too sure of. Something like "So you got your life, he lets you go go go". But whatever. The best part comes next. The music frequently returns to this main theme. You hear it on marimba, harpsichord, flute, electric guitar, whatever. The electric guitar sound is consistently great, as it was on Giombini's score for Sabata. It has more of a surf feel here. Of course my old nemesis the saloon piano is here, too, though in a more agreeable ragtime guise. There's also a really great tense piece with creepy vocalizing, I think it's sequence 4. This, too, eventually gives way to the jaunty theme music. The other theme that gets a workout first shows up in sequence 5, played on banjo then on fiddle. It's a lilting waltz and probably accompanies a romantic subplot. (I haven't watched the movie yet.) Sequence 7 is a workout for church organ. That organ returns for sequence 8, joined by pounding drums, strings and chorus. Sequence 9 ambitiously attempts the main theme only on percussion: cymbal, wood block, other hand drums. There's a pervasive timpani roll in the background. Eventually a Wurlitzer organ (or something similar) plays the theme, joined by solo male voice singing the words. Sequence 10 is starts as slinky jazz before becoming an atmospheric suspense cue. Sequence 12 has sick-sounding fuzz guitar, overblown guitar, chorus, drums and a general Iron Butterfly feel. Sequence 17 starts out as "classical music" complete with a chorus singing "Hallelujah"—"Hallelujah, Sabata", that is! I should go watch this movie right now. I have it here and I haven't seen a Lee Van Cleef movie in a few months.